It’s the last minute, and suddenly you realize that you forgot to hire a magician for your event. Not to worry, here are a few helpful hints for hiring a professional magician for your party or corporate event. Most magicians for hire, at least here in LA, have five star Yelp ratings. I think that’s because it’s such a face to face experience when you hire a performer. Frankly it’s a mystery to me, because I can’t tell you how many awful magicians I know who have a five star Yelp rating. Some of them actually give invitations to the Magic Castle in exchange for five star reviews. When you look at a magician’s photos and website, use your intuition. It may be more accurate than Yelp. Look at the magician’s videos. Videos will tell you most of what you need to know about their magic performances. If you do nothing else… do this. When it comes to magic awards and peer accolades, take them all with a grain of salt. As someone who has won multiple international magic awards, I can tell you that they don’t really matter that much. It certainly doesn’t hurt if a performer has some awards to brag about, but it doesn’t NECESSARILY mean they are actually good. Trust me on this. Once you’re confident that they are a good magician, give them a call and do a quick gut check. Ask yourself if they have the social skills to interact positively with your guests. If the magician has a publicly ticketed show, that’s a good sign. Go see it, or, at least read the reviews. It’s much harder for someone to “game” Yelp or Tripadvisor when he is literally performing for thousands of paid attendees each year who then proceed to leave honest reviews about the magic show they just saw. And, the mere fact that a magician HAS thousands of paid attendees each year is also a very positive sign. Trust your gut over all else. I hope this helps you find a top notch magician for hire. For recommendations in most major cities, feel free to drop me a message. Corporate Events – David Minkin is one of the world’s premier close-up magicians, and he blends his magic with inspiring presentations for a one-of-a-kind experience. He is a corporate event magician who combines unrivaled skill with a professional and positive message. He is in demand for corporate events around the world. A multi-award winning magician, David’s magic has been seen by millions of people, live and on television. His magic won first place from the world’s largest group of magicians, spanning 73 countries with over 13,000 magician members. So… you’ve got a hot date and nowhere to go, right? 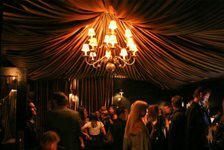 Here are some fun and unique dating ideas in Los Angeles. We asked our staff at the Evening of Enchantment to name their top 10 dating ideas in LA, and here is the list of ideas that they came up with. 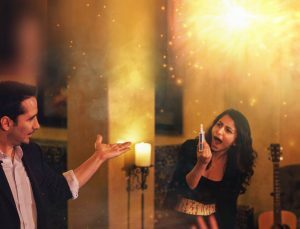 Incidentally, our magic and wine tasting event makes for a great romantic date. 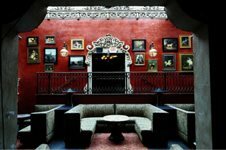 This place is one of the most ambient and interesting venues in Los Angeles. Perfect for a date. Check their website, as they often have live entertainment in the venue. Date note: You may have to wait in line on the weekends. During the Summer months, this is a fun date idea. Hilltop views of the city, wine, live music, vendors, and the most incredible tacos ever (rib meat, duck, and fish). Parking is surprisingly easy. When the lot is full, they direct you to a free lot on La Brea, and then shuttle you up, which takes all of about five minutes. This is one of the more fun, casual dating ideas in Los Angeles. Bring a sweatshirt or jacket… or just snuggle up with your date. You can also head into Yamashiro afterward for drinks and sushi with stunning, romantic views of the city. During the summer months, there’s nothing like packing a picnic basket and heading to the Hollywood bowl for a date. Whether you hit the Reggae fest or the philharmonic, being outside under the stars and listening to live music, while you nibble and sip wine is just a super cool romantic date idea. Again, bring a sweatshirt and plan to snuggle with your date. If you want to keep your date casual, there are lots of places to hike in Los Angeles. Runyon Canyon has a great view of Hollywood, and Trancas Canyon in Malibu has some nice ocean views and streams. Horseback riding in the hills. You can even take a ride to a local restaurant for a dinner ride. A unique Los Angeles experience. Just make sure your date is into that sort of thing and is not wearing high heels! Roller derby. Yep, you read it correctly. Take your special date to a roller derby match to watch the Los Angeles Derby Dollz put on a show. It may not be romantic, but it’s fun. It’s fun to get to know someone on a first date when you can explore a place together with plenty of entertainment options. Third street is a great place to poke around the small shops, grab a bite, or catch a show. It’s also an easy walk to the pier and the beach for a romantic stroll. You can head out to the Landing in Westlake and have a romantic dinner date at the water’s edge. It’s a bit of a quiet area, so it’s a nice way to finish up a day at the beach, as the lights begin to reflect off the water at sunset. If you’re going to see a movie on your date in Los Angeles, this is the theater to head to. The big screen is massive and you can choose your assigned seating when you buy your show tickets online. Another great theater is Grauman’s Chinese Theatre. A top-rated event on both Tripadvisor and “Eye on LA”, the event combines wine tasting, food, and an intimate show by one of the world’s premier magicians, David Minkin. It takes place at a candle-lit hideaway called Bardot Hollywood – a venue that is perfect for magical experiences. Each month, the show is open to a small number of guests. Get tickets in advance, as it normally sells out.